Cecidomyiidae (sometimes misspelled Cecidomyidae) is a family of flies (Order Diptera) known as gall midges or gall gnats. 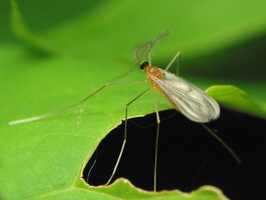 As the name implies, the larvae of most gall midges feed within plant tissue, creating abnormal plant growths called galls. These are very fragile small insects usually only 2-3 mm. In length and many are less than 1 mm long. They are characterised by hairy wings, unusual in the Order Diptera, and have long antennae.